All of the elements of network security together in a single volume written by the best and brightest experts in the field! Assembled from the works of leading researchers and practitioners, this best-of-the-best collection of chapters on network security and survivability is a valuable and handy resource. It consolidates content from the fields leading experts while creating a one-stop-shopping opportunity for readers to access the information only otherwise available from disparate sources. 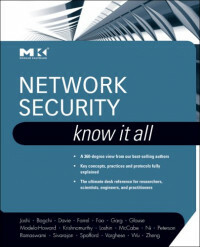 * Chapters contributed by recognized experts in the field cover theory and practice of network security technology, allowing the reader to develop a new level of knowledge and technical expertise. * Up-to-date coverage of network security issues facilitates learning and lets the reader remain current and fully informed from multiple viewpoints. * Presents methods of analysis and problem-solving techniques, enhancing the readers grasp of the material and ability to implement practical solutions. Ace your preparation for the skills measured by MCP Exam 70-284—and on the job—with this official Microsoft study guide. Work at your own pace through a system of lessons, hands-on exercises, troubleshooting labs, and review questions.